It seems I have been hearing about this author for years, probably because he was shortlisted several times for the Booker Prize. The Old Boys was his second novel. He immediately won prizes and went on to write novels, short stories, and even plays. Whatever he wrote, he kept winning prizes, awards and at last a KBE: Knight Commander of the Most Excellent Order of the British Empire. Though he was born, raised and educated in Ireland, he emigrated to England and stayed there. I was therefore expecting a great deal as I finally came to William Trevor on the 1964 list of My Big Fat Reading Project. The first unsettling surprise was that the "old boys" are quite old, in their 70s. Why would an author starting out in his 30s write about such old guys? The plot concerns a coming election for the next president of the Old Boys Association which is connected with the boarding school (called public school in England) these old guys attended. Anyone who has read British literature knows about the cruel and unusual goings on in those places, often leaving people scarred for life. I was not excited about reading another one of those stories. My boredom with these old boys continued to the end but since the story was contemporary with the early 1960s in Great Britain, I found a little to interest me. This is the time and environment that gave us all those great bands from Britain: the Beatles, the Stones, etc. This was when the rebellion was born. Though no one in the book starts a band, the story of these guys dredging up all their old friendships and hostilities as they dodder through meetings, had a quaint historical feeling, showing me what the lads of the 60s might have been wanting to shake up. In fact, many British writers in the 50s and 60s did write about the hidebound, stuffy but crumbling and defeated British class system and mores of the Postwar era: Muriel Spark, A S Byatt, Doris Lessing, Iris Murdoch and more. They eventually moved into more modern stories. I am sure William Trevor did so as well. Since his writing style is already quite good in The Old Boys, I will keep reading his novels as I move through my reading project, hoping to enjoy them more than I did this one. Have you read this author? If so, which books did you enjoy the most? Hmmm...You liked it but not that much? I had not heard of this author. Will investigate further. I have not read Trevor but I would like to. I can see how a book like this might be a little dull. I find that I can take to novels like this if I am prepared for a bit of a slow ride going in. Maybe that was my problem. I was prepared for greatness. I still have hopes for his later work. Yeah, I wonder myself why an author of that age would start with characters so much older than him. Strange. I am glad you share my wonder. I've not read Trevor, but it sounds as if he were describing the modern world as it existed in the early sixties and that would, of course, be a basis for the rebelliousness of the period, both there and here. The generation in control then may have been "the greatest generation" but they were, I think, quite hidebound and conservative in their attitudes and that was a motivation for the young who wanted a more open and tolerant society. Interesting times! It has been interesting reading all these books from the early 60s and getting a picture of it all looking back. Because when I was rebelling I was right in the thick of it but clueless about the history behind what I was rebelling against. I haven't read this but I have read The Children of Dynmouth, which was published in the 1970s. I found it interesting but very dark and disturbing - this one sounds quite different. If you do read more of his books, I hope you find some that you enjoy more! I do intend to read more and I have gotten lots of feedback on the ones people liked best. I just looked up The Children of Dynmouth and Joyce Carol Oates called it his finest novel so far. Ha! That fits with your description because she specializes in dark and disturbing. 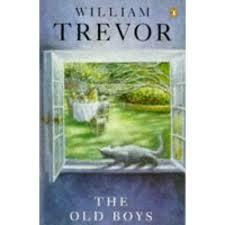 I haven't read anything written by William Trevor. Quite frankly, I've never even heard of him before. I have not read Mr. Trevor, but this one sounds like a bit of a snoozer. Still you got something out of it -- the beginnings of the crumbling perhaps. The beginnings of the crumbling--I like that!